Valentines Day began early for me - we left our accommodation just after 7am to drive to Beaver Creek - the skies were clear and another sunny day was upon us. My Slalom training has been going really well so I was looking forward to the race. Watching the top girls with Flo and Ronnie. After watching the top girls, we made our way out to the start. Putting on my skis before the race. The run began very well, I was moving well, kept a high line and had great speed. It was a much more straightforward course and flatter than Schladming so I was determined to give it my all. My split time (the best of my team) put me on schedule for a finish inside the top 60 (meaning qualification for the second run). However, I started getting late and the gates were coming towards me faster and faster and eventually I flew out of the course. My coach and team mates were very surprised that I failed to finish and I was so disappointed. After the race, with Flo. Having said all that, I do not believe that they should let the top 60 do the second run; it should be kept to the top 30 as it is in World Cup races. 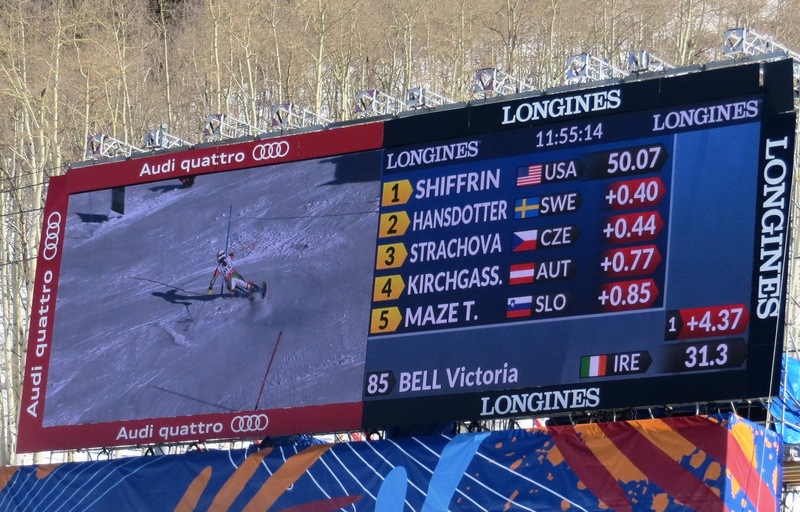 After the top 30 have completed their second run (and the winner decided) the stadium empties, the remaining 30 racers compete to an ever-decreasing crowd, there is no chance of them challenging for a top position and the fis points multiply by a factor of 5! After the race we were asked to sign autographs for the public. Pat, Flo, Conor, Maxime and I went along for Ireland and we were joined by Hungarian athletes and Mexican racer Sarah Schlepper. I could not believe how many people were queuing-up for our autographs - we signed non-stop for more than a hour!